Cricket may well be the most English of games, and there is certainly no more fiercely fought series than the clashes between England and Australia. The series is affectionately known, in both countries, as "The Ashes" and is usually fought out every two years. 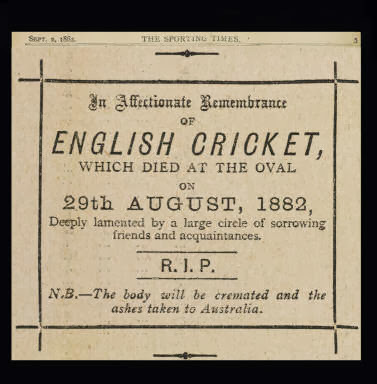 It was the Northern summer of 1882 and although England had lost in its previous Australian tour, it had never been defeated by the "Colonials" on home soil. Although sometimes referred to as the first Ashes test, the 1882 match was a single match played over two days and was only later elevated to the status of a Test. While "The Ashes" was an indirect product of England's defeat, it was not in existence at the time of the match. As to the game itself, from the beginning it looked to be England's for the taking. In the first innings on a rain soaked pitch Australia was bowled out for an unimpressive 63. With England in to bat, Australia managed to hold their proponents to just 101. The outstanding bowler for Australia was Fred (The Demon Bowler) Spofforth who took seven wickets for 46 with 147 deliveries. Evidence of the excitement generated by the match could be seen in the attendance which, during the course of the first day's play, rose from 10,000 to around 22,000. On the sloping embankment close to the chains people were standing 20 deep all round, and further back on the terraces the crowd was equally dense, while in the stands there was not a vacant seat. The roofs of the dingy brick houses surrounding The Oval also bore eager spectators. At 114 Jones was run out in a way which gave great dissatisfaction to Murdoch and other Australians. 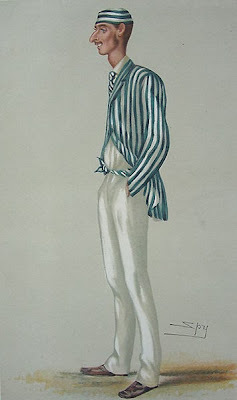 Murdoch played a ball to leg, for which Lyttelton ran. The ball was returned, and Jones having completed the first run, and thinking wrongly, but very naturally, that the ball was dead, went out of his ground. Grace put his wicket down, and the umpire gave him out. Several of the team spoke angrily of Grace's action, but the compiler was informed that after the excitement had cooled down a prominent member of Australian eleven admitted that he should have done the same thing had he been in Grace's place. There was a good deal of truth in what a gentleman in the pavilion remarked, amidst some laughter, that Jones ought to thank the champion for teaching him something. While the gentleman in the pavilion may have been amused, the Australians were not. Surely, if Spofforth or, for that matter, any of the Australian players heard those remarks they would have fumed at the condescension which would have been all that it took to inflame the Australians. Needing 85 runs to win, England had reached 51 with only three wickets having fallen. Famously, Spofforth announced to the Australians, "This thing can be done." And done it was, in no small measure due to the bowling of "The Demon." In the end, Australia won by 7 runs with Spofforth having taken 7 wickets in each of the two innings for 44 and 46 runs respectively. It would be ninety years before another Australian bowler, Bob Massie, matched or surpassed this. Massie bowled 16 for 137 at Lords in the second test of the 1972 Ashes series which ended in a draw with each side winning two of the matches. Even The Illustrated London News was forced to to admit, although somewhat reluctantly, that while the Australian victory was "not a great triumph," it was still "one of which the Colonial Eleven may well be proud." The story might have ended there had it not been for two events. 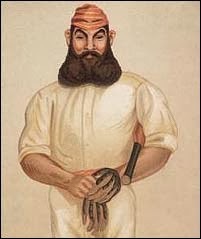 First, the English captain of the side playing the 1882-83 series in Australia, Ivo Bligh, later Lord Darnley, announced that he intended to "regain those ashes." As a result, the series became known in England as the quest to regain the Ashes. In Australia, England once again showed their prowess, winning 2 of the 3 scheduled tests on the tour. Australia took the first test and when a fourth, unscheduled test, was added the Australians won that as well. Just when and how the physical ashes and their urn came into the hands of the English captain is still a matter of dispute. The most widely accepted story is that Bligh was given the urn with the ashes of a cricket bail inside after an informal match at Rupertswood Estate outside of Melbourne. Not only did Bligh acquire the ashes he met Florence Morphy whom he married in 1884. The English captain always considered the small urn a personal gift. 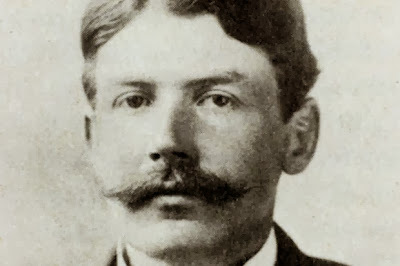 It was kept on the mantelpiece of his home until his death in 1927 at which time his widow gave the urn to the MCC (Marylebone Cricket Club) where the ashes reside in a small terracotta urn housed in the Cricket Museum at the Lord's Cricket ground. The Ashes series now stands (2013) England 31, Australia 32, and 5 drawn. As of this writing, Australia has just won three of the five matches being played and has regained the ashes! But one small footnote might be added here. Despite a cracking victory on English soil in 1882, Australia was unable to win another Ashes series there until 1899 when they won one test and drew four. But that is another story, for another time. For those readers unfamiliar with the "Laws of Cricket," a PDF copy of the latest compilation can be downloaded by clicking here. 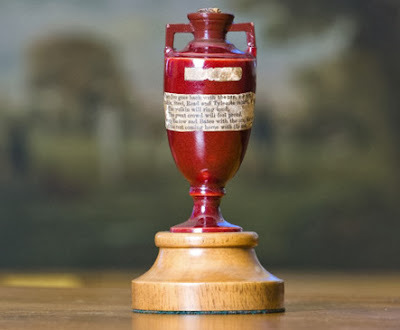 To see a brief video history of "The Ashes" and how they came to be, click here. NOTE: Australia won all five of the Tests in 2013-14. This was only the third time in history that this had been accomplished. The present Captain of the Australian side, Michael Clarke, is the only player to have participated in more than one of the 5-0 Ashes series (2006-7, 2013-14).